Santa Claus, Saint Nicholas, Saint Nick, Father Christmas, Kris Kringle, Santy, or simply Santa, is a gift-giving figure in various cultures who distributes presents to children, traditionally on December 24, Christmas Eve. The popular American form Santa Claus originated as a mispronunciation of Dutch Sinterklaas, which is a contracted form of Sint Nicolaas (Saint Nicholas). Father Christmas is a well-loved figure in many countries and predates the "Santa Claus" character. 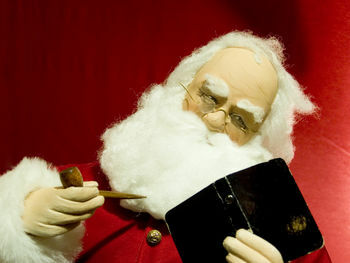 "Father Christmas" is similar in many ways, though the two have quite different origins. Using 'Santa' in places that predominantly call him 'Father Christmas' is often viewed as an Americanism and is quite rare, although they are generally regarded as the same character. Father Christmas is also present instead of "Santa" in Albania ("Babadimri"), Armenia ("Gaghant Baba"), Denmark ("Julemanden"), Hungary ("Mikulás"), Italy ("Babbo Natale"), Lithuania ("Kalėdų Senelis"), Brazil ("Papai Noel"), Portugal ("Pai Natal"), Romania ("Moş Crăciun"), Russia (" Ded Moroz"), Germany ("Weihnachtsmann" or "Nikolaus"), Scottish Highlands ("Daidaín na Nollaig"), France and French Canada ("Le Père Noël"), Ireland ("Daidí na Nollaig"), Finland (" Joulupukki"), Norway ("Julenissen"), Sweden ("Jultomten"), Bulgaria ("Dyado Koleda"), Turkey ("Noel Baba"), Italy ("Babbo Natale"), Serbia and Bosnia and Herzegovina ("Deda Mraz"), Spain and Spanish-speaking Latin America ("Papá Noel"), Afghanistan ("Baba Chaghaloo"), Iraq and South Africa ("Vader Kersfees"), Chile (Viejo Pascuero), Malta ("San Niklaw"), Egypt ("Papa Noël"), Iran ("Baba Noel"). Santa Claus is a variation of a Dutch folk tale based on the historical figure Saint Nicholas, a bishop from Myra in Asia Minor (the greater part of modern-day Turkey), who used his whole inheritance to assist the needy, the sick, and the suffering. His charity became legend when a man lost his fortune and found himself incapable of supporting his three daughters, who would not be able to find husbands as they lacked dowries. This man was going to give them over to a life of prostitution; however, St Nicholas provided them with gold and cookies, enabling them to retain their virginal virtues and marry. This inspired the mythical figure of Sinterklaas, the subject of a major celebration in the Netherlands and Belgium, Germany (where his alleged date of death, December 6, is celebrated the evening before on December 5), which in turn inspired both the myth and the name of Santa Claus. "Santa Claus" is actually a mispronunciation of the Dutch word "Sinterklaas" by the English settlers of New Amsterdam (later renamed New York). Whilst in those countries Saint Nicholas is celebrated as a distinct character with a religious touch separate from Christmas, Santa Claus is also making inroads as a symbol during the Christmas season. He now forms an important part of the Christmas tradition throughout the Western world and Japan and other parts of East Asia. Santa Claus is traditionally represented in a red cloak with white fur trimmings, a reference to St Nicholas, who reputably performed his charitable acts dressed in his red bishop's robes. In many Eastern Orthodox traditions, Santa Claus visits children on New Year's Day and is identified with Saint Basil the Great, Archbishop of Caesarea in Cappadocia, Asia Minor (contemporary Turkey), whose memory is celebrated on that day. According to the Greek tradition, he is supposed to visit children and give presents every January 1. This festival is also marked by the baking of Saint Basil's bread (Gr. Βασιλόπιτα - Vasilópita), a sweetbread with a coin hidden inside. Depictions of Santa Claus also have a close relationship with the Russian character of Ded Moroz ("Grandfather Frost"). He delivers presents to children and has a red coat, fur boots and long white beard. Much of the iconography of Santa Claus could be seen to derive from Russian traditions of Ded Moroz, particularly transmitted into western European culture through his German folklore equivalent, Väterchen Frost. Conventionally, Santa Claus is portrayed as a kindly, round-bellied, merry, bespectacled white man in a red coat trimmed with white fur (perhaps remotely derived from the episcopal vestments of the original Bishop Nicholas), with a long white beard and green or white gloves. On Christmas Eve, he rides in his sleigh pulled by flying reindeer from house to house to give presents to children. To enter the house, Santa Claus comes down the chimney and exits through the fireplace. During the rest of the year he lives together with his wife Mrs. Claus and his elves manufacturing toys. Some modern depictions of Santa (often in advertising and popular entertainment) will show the elves and Santa's workshop as more of a processing and distribution facility, ordering and receiving the toys from various toy manufacturers from across the world. His home is usually given as either the North Pole, in northern Canada, Korvatunturi in Finnish Lapland, Drøbak in Norway, Dalecarlia in Sweden, or Greenland, depending on the tradition and country. Sometimes Santa's home is in Caesarea when he is identified as Saint Basil. L. Frank Baum placed his home in The Laughing Valley of Hohaho. In the original Dutch tradition, Sinterklaas lives in Spain and is accompanied by a great number of black servants, called 'Zwarte Pieten', which means Black Petes. 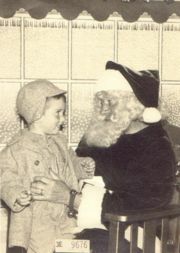 Several rituals have developed around the Santa Claus figure that are normally performed by children hoping to receive gifts from him. See main article: Santa Claus rituals. Ho ho ho is the way that many languages write out how Santa Claus laughs. "Ho, ho, ho! Merry Christmas!" Ho ho ho represents an attempt to write the deep belly-laugh of Santa Claus, as opposed to the conventional, higher-pitched ha ha or he he that represents the laughter of thinner characters, or the snickering, cynical bwa/mwa ha ha! associated with the villains of melodrama. Jacob Grimm asserts that "Ho ho ho" was the hunting cry of Odin during The Furious Host. Odin being attributal to Santa Claus.
" H0H 0H0" is a postal code used by Canada Post for routing letters sent in Canada to Santa Claus at the North Pole. The alphanumeric sequence falls within a grouping associated with the Montreal, Quebec area. Rudolph, Dasher, Dancer, Prancer, Vixen, Comet, Cupid, Donder, and Blitzen are the most commonly cited names of Santa's nine reindeer. In the poem " The Night Before Christmas" (attributed to Clement C. Moore), from which the names of the reindeer come, the reindeer known today as Donner and Blitzen were originally Dunder and Blixem (the Dutch words "Donder" and "Bliksem" stand for "thunder" and "lightning", as rendered in English orthography). Dunder was later reprinted as Donder, which developed into Donner (the German for "thunder"); while Blixem quickly became Blixen and then Blitzen (German for "lightning"). . All of these reindeer names are recited in the first verse of the popular song Rudolph the Red-Nosed Reindeer, which in turn has helped make Rudolph by far the best known and most popular with children. Rudolph the Red-Nosed Reindeer was born for the American department store chain Montgomery Ward in 1939, and has since entered the public consciousness as Santa's ninth and lead reindeer. All of the above reindeer have been proven to exist throughout multiple theatrical appearances, although in the film The Polar Express only eight of the reindeer can be seen pulling Santa's sleigh. According to the NORAD Santa Tracking website, Santa is tracked every Christmas Eve with the same equipment that tracks the presence of aircraft entering North American airspace. Excerpt from Josiah King's The Examination and Tryal of Father Christmas (1686), published shortly after Christmas was reinstated as a holy day in England. Folger Shakespeare Library, Washington, D.C. Despite Santa Claus's mixed Christian roots, he has become a secular representation of Christmas. As such, a number of Christian churches dislike the secular focus on Santa Claus and the materialist focus that present-receiving gives to the holiday. Such a condemnation of Santa Claus is not a twentieth century phenomenon, but originated among some Protestant groups of the 16th century and was prevalent among the Puritans of 17th century England and America who banned the holiday as either pagan or Roman Catholic. Following the English Civil War, under Oliver Cromwell's government Christmas was banned. 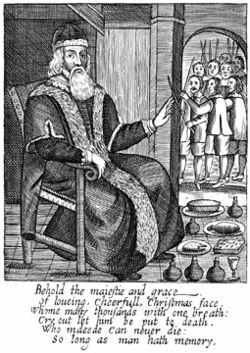 Following the Restoration of the monarchy and with Puritans out of power in England, the ban on Christmas was satirized in works such as Josiah King's The Examination and Tryal of Old Father Christmas; Together with his Clearing by the Jury (1686) [Nissenbaum, chap. 1]. Rev. Paul Nedergaard, a clergyman in Copenhagen, Denmark, drew the ire of Danish citizens in 1958 when he declared Santa to be a "pagan goblin" after Santa's image was used on fundraising materials for a Danish welfare organization [Clar, 337]. One prominent religious group that refuses to celebrate Santa Claus or Christmas for similar reasons are the Jehovah's Witnesses, but several denominations of Christians have varying concerns about Santa Claus. Some Christians would prefer that the focus of the Christmas season be placed on the actual birth of Jesus. Some parents are uncomfortable about lying to their children about the existence of Santa. Some parents worry that their children might think that if they were deceived by their parents about Santa Claus, parents might also be deceiving them about the existence of God. Some in this group who still wish to participate in the festive gift-giving atmosphere of "Santa season" will shop for toys to donate to poor children on St. Nicholas's feast day, December 6. This is an opportunity to instill the Christian value of secret charity, which Nicholas was known for. Although feast days are usually not acknowledged in Protestant denominations, this tradition has found acceptance there as well. While these viewpoints do not represent the majority of Christians, their comments have drawn the attention of critics such as the fictional Landover Baptist Church, whose website satirizes and parodies this viewpoint. The website specifies that Satan is disguising himself as Santa (notice the same letters used in an anagram) to deceive people into a materialistic celebration. But some people do not believe that because "why would the devil want kids to be nice all year if he is evil? ".